Even before I started blogging, I already knew about WAGW. I recall it was a long time ago when I first went in their Cebu branch. I was in 2nd year High School then and being fashionable without breaking the rule of practicality was one of the things i had in mind. Still now actually. I bought a black pearl necklace with chains, a denim skirt and a top all for less than a thousand bucks. (This I'm very sure of cause items at bargain prices were never part of my short-term memory). I even remember they used to give out this yellow dust bag printed with WAGW (in pink fonts) and a gold paper bag which they still use til now. 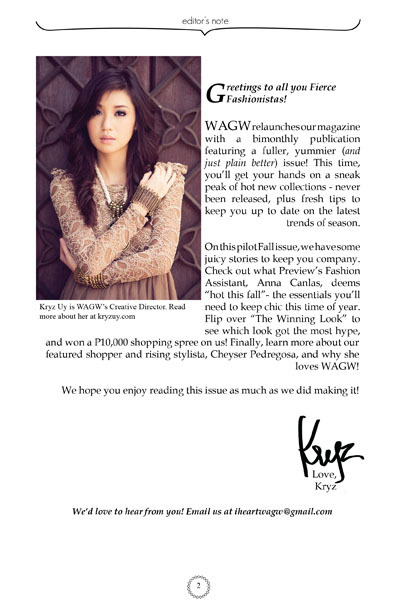 When I started blogging, I happened to land on Kryz's lookbook and noticed how she always wore WAGW. Then I remembered how I loved the store since I was 15! I dint know whats gotten into me that I started emailing WAGW about how I loved their store and how I hoped they opened one in Davao. (They didn't have one then) Kind enough of them to reply saying they will be opening one soon in Abreeza and glad to say they finally did! Thank you Kryz & WAGW! 1. Why do you love WAGW? 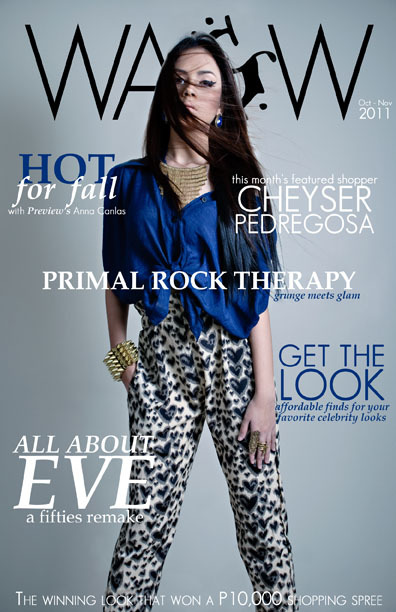 WAGW clearly embodies the needs of the regular girl and caters to all styles. As a recessionista, I am always in constant search of great finds that give me a bang for my buck without compromising my taste. WAGW delivers! 2. Give a quote/tip you believe in. Accessories are like first-aid kits; it saves you when you’re in a life-or-death situation. Well in fashion that is! What a great feature! :) love the dress you're wearing! I love your red outfit!! !